More speed, more accuracy, more efficiency: Production facilities are under pressure. They must produce more and better products in less time while reducing faulty parts and machine downtime. Furthermore, customer requirements for smaller individual quantities are to be considered. This difficult task can be facilitated through a clever combination of measurement and control technology. Inline measurement technology is directly integrated in the production process and gives instant information about critical machine and production data. Acquired data from the “live process” allow the super-ordinate control unit to react immediately if, for example, tolerance values are exceeded. This has a positive impact on the production process as a whole: Quality control, load factor, maintenance and production quantity. There are different ways to integrate ADDI-DATA products in your production processes. Here is an example with MSX-E systems. 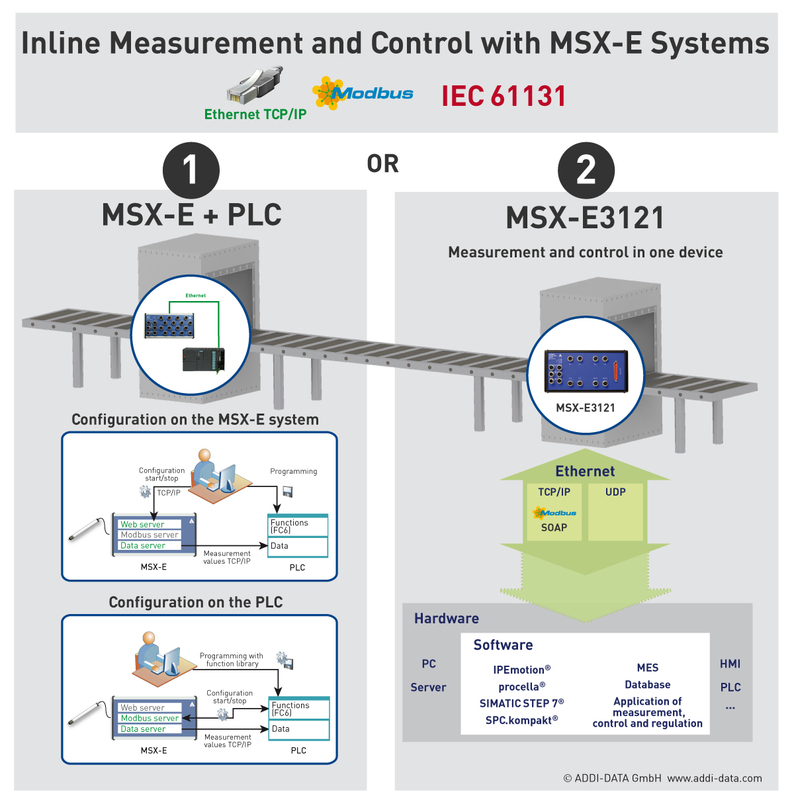 You can connect an MSX-E system to your PLC or use the new MSX-E3121 as a replacement for a small PLC. Find a larger version of this image here. Production wastage does not only cost energy, it wastes raw materials, time and money and causes delays in delivery. The harsh environment of production facilities requires a high interference resistance of the measurement and control technology. Only few solutions can meet these requirements: Technologies that are working well under laboratory conditions are not suitable for use in an environment with current peaks or electromagnetic interferences. But interference resistance is only a basic requirement for 100 % quality control; the measurement accuracy is at least as important. 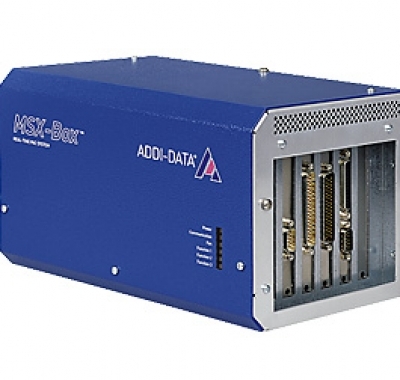 For ADDI-DATA, this has been an area of expertise for 30 years: Measurement solutions with a resolution up to 24-bit and numerous protective circuits guarantee a high measurement quality in a harsh industrial environment and thus 100% quality control even in case of a fast cycle. With efficient measurement technology it is possible to carry out measurement tasks in ongoing processes, which would not be possible with a PLC: Vibration, surface, diameter measurement etc. The most interesting benefit is that the PLC or other control unit or external software is relieved as much as possible through onboard calculation of the measured data. The measurement boards or systems acquire sensor or machine data and compare them to predefined tolerance values. Only if these limit values are exceeded the super-ordinate control unit or external software is informed. 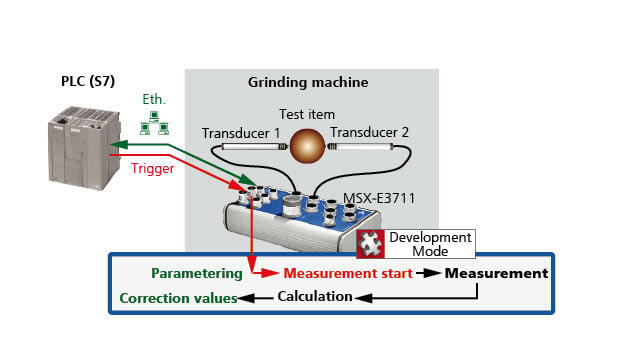 Efficient measurement technology can also be used for machine data acquisition. To optimise the machine load factor, machine data like lot size or downtimes is collected and fed into a database for statistical analysis – without programming. For a better understanding of the transferred data, the raw data can be converted into real variables. Production data and quality parameters can also be stored in the database. Thus ADDI-DATA measurement solutions build a bridge between IT level and production level. Machine stops are expensive. Thus machine status monitoring is important for an early detection of errors, wear and malfunctions in order for maintenance work to be carried out during the next revision or during the next planned downtime. Furthermore, timely maintenance of machine and tools also prevents consequential damage. The purchase of spare parts and possibly the organisation of service technicians to replace the machine parts are also part of the maintenance planning. Timely planning saves money and reduces the overall machine downtime. This means an increase in the machine running time and production. 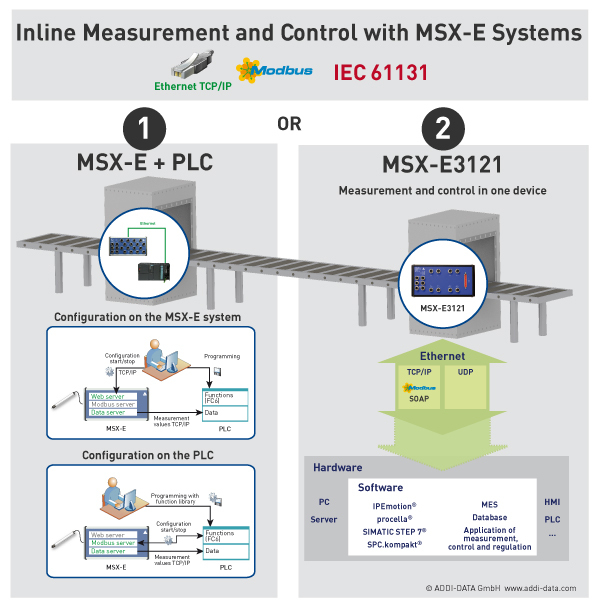 Take load off your PLC and extend their functionality with measurement tasks close to the sensor or the machine: The intelligent Ethernet systems of the MSX-E series are perfectly suited for this! NEW! 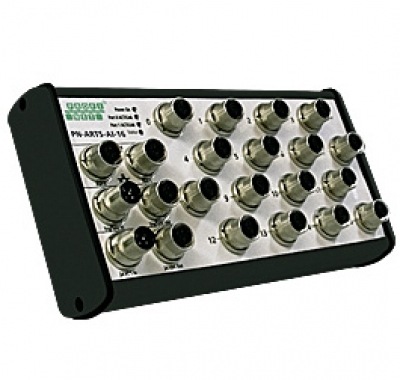 MSX-E3121 as a substitute for a small PLC or in addition to a PLC: Analog and digital I/O up to 500 mA per output for measurement and control tasks in one device! The Programmable Automation Controller (PAC) system MSX-Box was specially designed for industrial measurement-, control and automation tasks with processes that must be executed within a predefined time period. 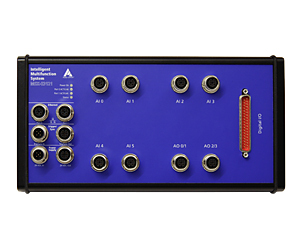 With ADDI-DATA measurement boards, numerous signal and sensor types can be acquired fast and precisely in order to control the subsequent processes. The boards are highly interference resistant and specially designed for the harsh industrial environment. 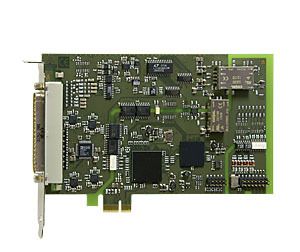 The x-ARTS real time systems are I/O slave systems for EtherCAT, ProfiNET and VARAN for measurement and control tasks.